If you are following me on my Instagram account @anisfarhanaaliman91, you might have noticed that I've once again visited South Korea last August 2017 following my first visit in 2016 (lol its now August 2018). To be honest, the first trip in 2016 was really rushed and at the last minute so I did not make any thorough plan before going there. A few of my friends and readers have been asking me to share about that 5 days 4 night holiday in Seoul and I'm ashamed to say that I've failed in finishing all the travel posts that I need to do before this second trip 😅; but hey, maybe it's for the better because I can write more in-depth posts about each area I've visited so far using all the information I've gathered during my two trips there. Anyway, for my second visit, I decided to take a longer holiday and try to cover regions outside of Seoul as well. After a long discussion with my bestie Yana, we decided to make it 11 days and 10 nights trip covering three regions in South Korea; starting from Busan, to Gyeongju and finally Seoul. Quite ambitious, but we were really determined to make this visit worthwhile. For that, instead of a return ticket Kuala Lumpur (KUL) - Seoul (ICN)- Kuala Lumpur (KUL), we decided to purchase a multi-city tickets Kuala Lumpur (KUL) - Busan(PUS) and Seoul (ICN)-Kuala Lumpur (KUL) instead. Buying multi-city ticket can be slightly more expensive but because we booked the ticket months earlier, it was pretty affordable. I will make a separate post on my budget throughout the journey so stay tuned! The first city we visited was Busan or also known as the port city of South Korea. Honestly, when I think of Busan, I'll think of the beaches, great seafood, the dialect (satoori) and the drama Reply 1997 (hands up if you've watched it!). Located in the most south-east portion of the Korean peninsula, it's actually the second biggest city in South Korea! Known for its exciting summer crowd, there are a lot of interesting attractions to visit there; for example, the Haeundae Beach, Gwangalli Beach, Yonggungsa Temple, Oryukdo Island and etc. We departed from Kuala Lumpur to Busan on 25th August 2017 (1AM) and arrived at the Gimhae International Airport in Busan approximately around 8AM (9AM Korean time). After getting freshened up, we started to head off to the hotel we've pre-booked before arriving which is located right next to Busan Train Station (부산역) - KTX. 2. After arriving at Sasang station, make an exchange to (Line 2 > Jangsan) going to Seomyeon. Note: '>' indicate the train's direction. After arriving in Busan Station (Line 1), all you have to do is to exit the station by taking the stairs up (next to the convenient store G25). At that time, they were doing some construction in front of the main station area (Busan KTX Station). I am not sure if they still are but if you walk a bit more after ascending the stairs, you should be able to see the main station from where you are. 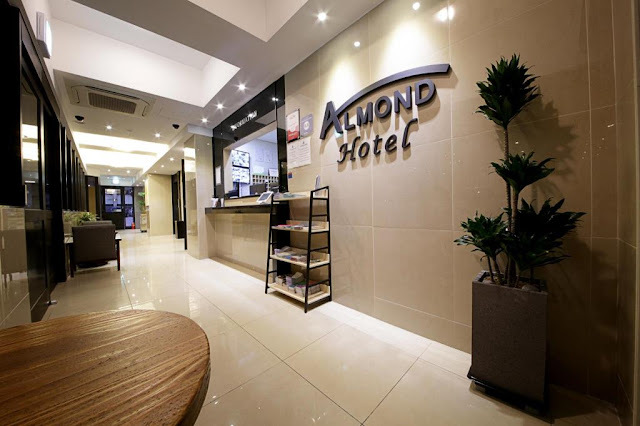 The hotel that we booked our stay at was called the Almond Hotel Busan Station & is located near the Busan Train Station (both main station & Line 1), with walking distance less than 300 meters from both stations. Although we could get a cheaper place, we decided to go for this hotel for several reasons; mainly due to its accessibility. You will be able to see why I said this if you read through my Busan story until the end! We paid approximately RM550++ for a two nights stay for two people at their Business Room which I personally consider as a great deal considering the exchange rate at the time! The room was pretty clean and spacious, with both bathroom and bathtub, gigantic TV and also a desktop computer. Out of the three accommodations I stayed at during my travel period, this hotel was the most comfortable for me. The service was excellent. We were planning to just drop our luggage at the storage area and come back to check in later in the evening since we arrived way before (around 11.30AM) than standard check-in time (3PM onwards), but thankfully they let us in our room earlier! That was really awesome; it was still summer in Busan so I was dying to take a shower to cool down by the time we arrived. I also noticed that this hotel is listed in Visit Korea website which makes it much more credible to me. I felt safer staying there. Do I recommend this hotel? Yes. Throughout my visit to Busan, there were two modes of transportation that we relied on to go around the city; trains and buses. For the first day and night in Busan, we managed to cover the Gamcheon Culture Village, the newly open Songdo Marine Cable Car (Busan Air-Cruise), and the BIFF Square. All of them are accessible by taking either the local bus or the train. You can buy the train's ticket at the ticketing machine available at the train stations or just use a transportation card instead; T-Money or the Cash Bee Card are available to purchase at their convenience stores. All you need to do is reload money into the card at the convenient store or use the reload machines available at the train stations in order to use it. We also managed to redeem a complimentary Subway Pass provided by the Busan Tourism Organization for Malaysian at the Busan City Tour Information Center located at the 2nd Floor of Busan KTX Train Station (near platform 1) which contains about 5,000 won. This is one of the hottest tourist spots in Busan due to its Instagrammable nature and we took about three hours to basically cover the majority of areas there. If you are the type of traveller who just wants to visit this place in order the cross off your bucket list and take a couple of pictures, three hours would be just enough to do that. I personally wished that we had more time to spend there as I like to sit and soak in the culture more. There were souvenir shops and cafes that I didn't get to explore longer as we are rushing to the next destination in order to make it in time for the sunset viewing. A little background story on the Gamcheon Village; it used to be a dull area and filled with petty crimes. Considered as a Korean slum in the past, this area sheltered Korean War refugees who escaped to Busan to hide away from the horrible event. In 2009, the Korean government took an initiative to reform the area making it a safer, tourist-friendly place. With the help of artists and students, they transformed the once lacklustre neighbourhood into a place filled with beautiful murals, unique sculptures and vibrant colours which earned it the title 'Machu Pichu of Busan' and 'Korea Santorini'. True to its nickname, the Gamcheon Culture Village Busan shows a similar aesthetic like the Santorini, filled with residential houses built in between long and narrow staircases on the foothill of a coastal mountain facing towards the sea. You can see the beautiful view of the ocean, while occasionally feeling the windy breeze of the sea that's from every angle around the area. Since the place is a normal residential area, it felt ordinary yet breathtaking all at the same time. Because of this, I was low key jealous of the people who actually live here; except for the part where you'll have to climb the never-ending flights of stairs every single day. LOL! Different angles, the same breathtaking view. Shops all around; including cafes, art shops, and food and drinks stalls. A more everyday view of the area. It was summertime in Korea, so of course, we need a bit of cooling! Purchased some cute postcards, two to keep, and another two posted out! Being an artsy neighbourhood, on top of the beautiful paintings, murals and decorations around the areas, the place was also packed with gifts and souvenir shops and one of my favourite finds was a very cute shop that sells beautiful postcards with beautiful illustrations of Gamcheon village. The shop also provides the service of posting out the postcard you purchased from there anywhere you want, at any date you want as long as it's within the dates made available by them. It is such a great way to send yourself or friends a surprise. I chose to post myself a postcard from the past as well which by the way might arrive anytime soon so I am pretty excited about that (and I don't remember what I wrote anymore)! In front of one of the pretty cafe there! Beautiful Korean architecture from one of the building. Would I recommend this place? Yes! Although I would advise you to wear an appropriate shoe as it can get a bit tiring going up the narrow stairs. Also, if you have the time, make sure to go and snap a picture with the famous landmark of the Little Prince there as well. I had to skip that because the queue was long. Bringing a tripod or selfie stick would be ideal as well because every corner there is picture worthy! 1. 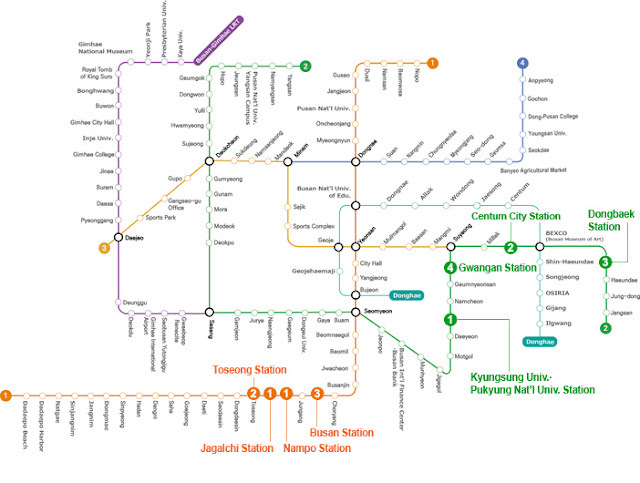 Go to Toseong Station (Busan Subway Line 1), Exit 6 or Exit 8 (if you want to walk 1km). 2. For Exit 6, after exiting, walk shortly uphill, and you'll find the bus stop near the shops. 3. Take local bus Saha 1-1, Seogu 2 or Seogu 2-2 to Gamcheon Elementary School Bus Stop. Note: The bus stop is very near as long as you chose the correct exit. We met a very nice grandma at the station who kindly shown us the bus stop (even without us asking) so walking time was just around 5 minutes! By the way, the bus journey was pretty rough for us due to the nature of the road and hilly area (it's probably just the driver though), so make sure to hold on tight. I love sunset so we decided to go and view the sun setting down from the inside of the newly opened Busan Air Cruise. Located at Songdo Beach, Busan, reaching there was only possible by bus. The journey was fairly quick and easy especially with the help of our trusty Google Map app and the kind Busan locals. We arrived there safe and sound at around 6.30PM-7PM which was just perfect for sunset viewing! I would recommend you to check the sunset time for the best viewing pleasure. Our view on the way to the destination. One: we need to save money so we can last through our 11 days trip. Beautiful view of Busan skyline. It was getting darker when we took the second trip back to the starting point. It was amazing. The view is just breathtaking and we were lucky since we managed to experience it both in daylight and after the sun has set. Looking far towards the never-ending sea, and the beautiful horizon was exhilarating while the night lights coming from the buildings made us super excited for what to come next in our trips. Night view during the return trip. Since the place was relatively new when we visited (they launched in around June 2017), it was really nice to be experiencing the brand new attraction. There were not many references online when we were doing our research before the trip, but thankfully the trip there was easy and went without a hitch. Gosh, talking about it makes me want to go there again. And, did I mentioned how beautiful Songdo Beach is? It's so clean and calm. We saw quite a lot of seafood restaurants along the beachside as well, so if you are thinking of finding a place to enjoy the Busan seafood, you might want to try and drop by. 3. Get off near Songdo Beach Parking – Namhang parking lot (near Namhangdaegyo bridge ramp). It was late evening (about 8PM-9PM) when we arrived at the BIFF square. 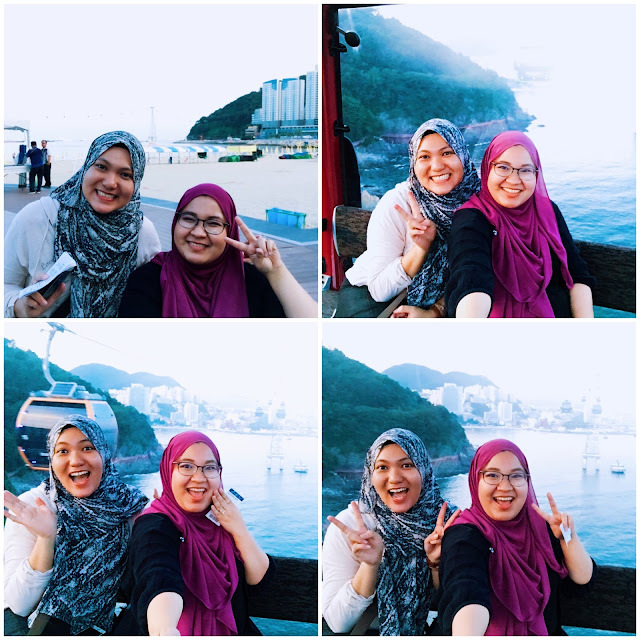 We came straight from the Busan Air Cruise Bay in Songdo Beach, by taking a local bus. Nearby is the Jagalchi market, a tourist hot spot when it comes to fresh off the sea local seafood. If you love them or feeling adventurous to try a various type of cooked and raw seafood, make sure to drop by the market. As for us, we decided to skip on having too much seafood because, at that point in time, it wasn't long after I had my appendix surgery. My stomach was still sensitive to a lot of dishes and we don't want me to get an upset stomach and ruin the rest of the trip. It was a shame though, because I love sashimi and seafood, and I really want to eat some of them at that time. There was a lot of 'pojangmacha' there too. I am a Muslim and I don't drink any type of alcohol and I have to be careful of some ingredients when deciding to buy any food, but for my non-muslim friends who wish to experience authentic Korean alcohol experience, I guess you guys can take a look at the areas. If you don't know what is a 'pojangmacha', it's basically a street stall/tent/on wheel transportation that sells alcohol along with popular street food snacks like sundae (blood sausage), tteokbokki, gimbap, hotteok and other types of 'anju' (dishes accompanied with drinking). Around BIFF square there were a lot of shops as well, for example; Olive Young and some other clothing places. We didn't explore much there as we decided to go back earlier and rest for the second day of our trip. On normal days, there should be a halal stall selling Indonesian 'Mee Goreng' there as well, but we couldn't find it that day. We're guessing that it was closed because it was around Eid holiday time. 1. You can take the bus or train to Jagalchi station. We relied on my basic Korean conversation ability throughout the trip and thankfully it was almost hassle-free except some occasional confusion because of my bad navigation skill. LOL, I am really bad at reading the map. 😂 Thankfully, the people in Busan were really helpful most of the time so my best friend and I had a blast touring by ourselves. If you are not confident about going around with no guide, I suggest you to try booking a one day tour which will make commuting easier. For example, this Busan 1 Day Tour that I found online which will cover a variety of activities and areas including strawberry picking, visiting Songdo Skywalk and Gamcheon Culture Village as well as Dadaepo Beach. You can also try purchasing the Busan City Tour Bus ticket which we did on our second day in Busan in order to cover more areas. I will talk about that in my next post, so stay tuned! Travel envy right now T.T Gamcheon Cultural Village is such an Instagrammable place! I want to go again too! So many spots haven't go and take pic.. once is never enough.